Swedish Week continues with a special guest Sarah Bagner, of London-based Supermarket Sarah, who joins us to talk about inspiration, entrepreneurship and Swedish design. I met Sarah many years ago in my past life working in advertising, and since then we've both left the ad world to pursue other ventures - me, motherhood and she, a brilliant online retail concept that started in her living room and has spread to galleries, shop fronts, bars and even Selfridges London, one of the UK's largest department stores. Sarah has worked with brilliant designers including Fred Butler, Patternity, Donna Wilson, Tatty Devine and many more, and her work has been featured everywhere from Style Bubble and The Guardian to BBC News (seriously awesome stuff). 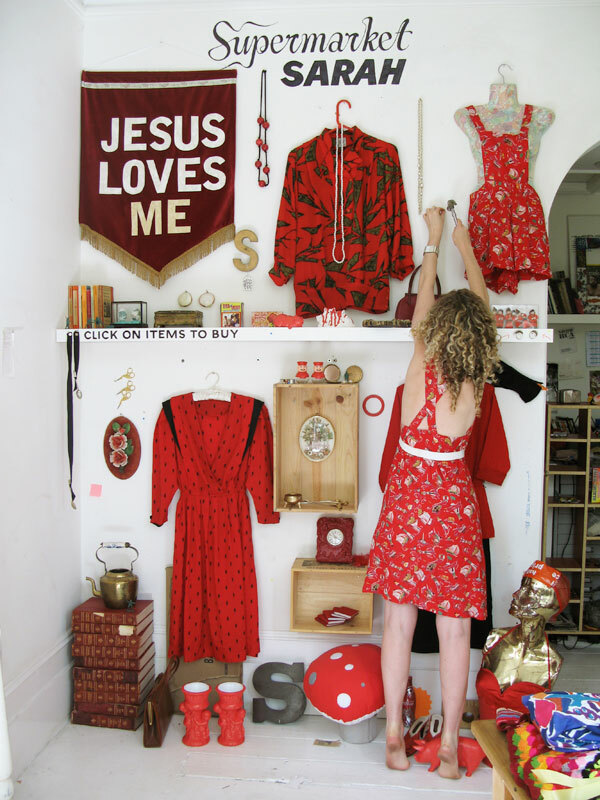 Below is one of Sarah's gorgeously styled "walls." 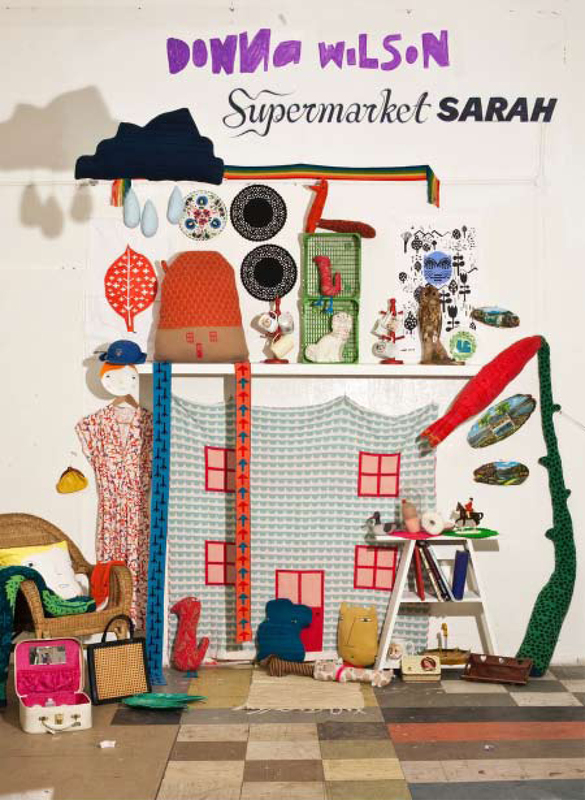 You can browse her current wall on the Supermarket Sarah website. With an impeccable eye for style, a keen business sense and a never-ending supply of energy, Supermarket Sarah is an inspiration. I feel lucky to have the chance to ask her a few questions. Thanks, Sarah, for sharing your wisdom with us! How Swedish are you, really? My parents are Swedish but I was born and bred in London! So I'm kind of Swinglish! How did you come up with the idea for Supermarket Sarah? I was working in digital advertising but was somehow eager to create something personal and work in a more tactile way. I started doing Portobello market on a Friday as my auntie in Sweden had hoards of vintage clothing she wanted to get rid of. I started have a penchant for all things weird and wonderful. I was also working as a stylist and assisting on various amazing shoots...the site evolved as a love child of all that! What prompted you to make Supermarket Sarah your full-time venture? I had to at one point as otherwise I couldn't have tested it. What were you doing before that, and how did it help you take Supermarket Sarah to the next level? All the advertising work I did and in fact everything I'm about has come into play with SS! All my friends and family have also chipped in - for good and bad! It's been very all-consuming! You now have a huge wall set up in Selfridges. How did you take the shop from exclusively online to retail? Selfridges initially invited me to do a wall in their Concept store and this was an amazing opportunity. It was a 30 foot high wall and I commissioned some brilliant "Supermarket" props, sourced all sorts of wonders both vintage and new designer. It was super to see something which started as an idea in my living room transported to Selfridges! I blogged on the Selfridges site so there was still a connection to the online world and I often talked about where I sourced the items and the stories behind each object online. Now I have a pop-up store on the ground floor in the giftware department. I've realised that products need to be stocked in multitude otherwise it somehow scares shoppers. Online you can just offer one, but in reality this makes it seem like a gallery. So now even if something is vintage, I try and offer lots of similar types of things on one shelf. Eg, a variety of vintage spoons, aprons etc. Where do you find inspiration? At markets, galleries....in little observations...in those few moments when you step outside of yourself and see things in all their absurdity! Do you find that Swedish design influences your style? Yes, Swedish design is just intrinsic to Swedish Life. From their milk cartons to their undergrounds, to their homes and lifestyle. It's simple and it just works! For some reason when this translates to other countries it seems really luxury but in Sweden it's not really like that...and I love Swedish 60's prints and have various Swedish designers on board! Where do you find all of the items and how do you decide what works together? My auntie is a massive hoarder and she has a whole house full of vintage Swedish finds! The Supermarket Sarah network of new designers just grows and grows with each wall...I think the mix of new and old works really well, one compliments the other. What one piece of advice would you say could translate from what you do with Supermarket Sarah to styling in the home? Keep it personal! What’s next for Supermarket Sarah? Watch this space! Any trends we should be on the lookout for? 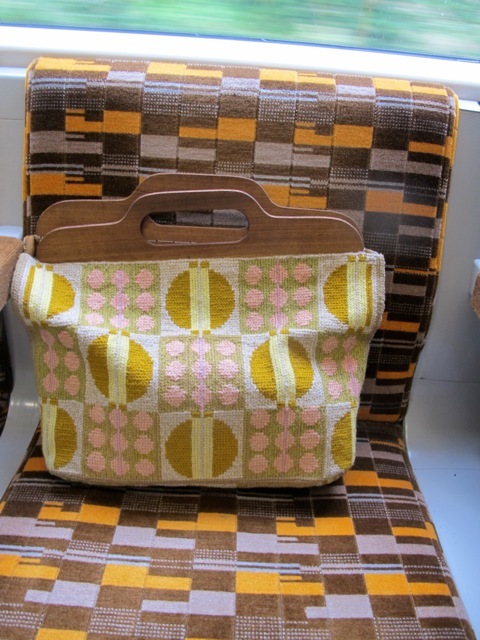 I love 60's mustards and browns - I have a bag at the moment which I keep losing on the overground train as it blends in with the train seats! Any advice for the creative entrepreneurs reading this? JUST DO IT! If you like this post or just want to say "hi," don't be shy, leave a comment below. Swedish Week: An Imaginary Trip to Stockholm.